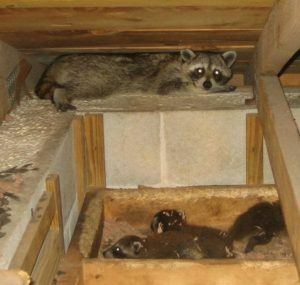 Although many people find masked-face raccoons adorable, these critters can pose significant problems to humans and pets, especially when they move onto your property. Raccoons “are considered a primary carrier” of rabies, says The Humane Society of the United States. They can also transmit the raccoon roundworm and a bacterium called leptospirosis to humans and pets, which can pose life-threatening health risks. Why Do Raccoons Invade Homes? Raccoons are scavengers. In search of shelter and food, they often discover homes and businesses provide ideal locations for nests, as well as ample food and water sources for themselves and their young. Trust the professionals at Critter Control who have more than 30 years of experience to safely and humanely remove raccoons from your property or business. Our removal specialists have the expertise to eliminate your critter problem and repair any damage caused by the nuisance critters. Contact us today to schedule a free inspection!